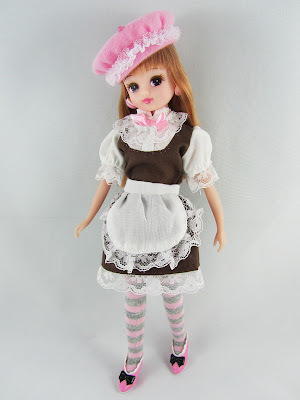 Anyway, before I completely go off-topic, the maid costume on Licca is one of my 100yen finds at a Daiso store. Not of the best quality but an excellent find for something that cost about a dollar. This outfit reminds me of those maid cafe girls. I added the striped socks and beret to match with the pink bow on the dress for that cuteness factor. The outfit originally came with black shoes but I thought Licca's pink ones were more appropriate to go with the overall look. Now she's ready to be at your service!